﻿Peter Max is an art icon. He literally painted the backdrop for the psychedelic 60s. His work has inspired a couple of generations of artists and that same work is perhaps the most imitated style since that time. His artwork now hangs in 1,123 museums around the world. He has painted and rubbed shoulders with presidents and rock stars. And on Tuesday his latest book, The Universe of Peter Max (published by Harper/Collins), was released to the public. The Free Press was given an advance copy of the book and HarperCollins arranged an interview with Max on the day it was officially released. With a forward written by famed astronomer Neil DeGrasse Tyson, one might expect The Universe of Peter Max to soar into the cosmos. It does not disappoint. Stunning both visually and in its anecdotal revelations, Max's latest work contains a treasure on every page. Think that's hyperboly? Well, I started my conversation with Max explaining the Free Press and the artist shared an interest in environmental issues. Many here in Ohio may recall the 2002 incident in which a cow escaped a slaughter house near Cincinnati and remained on the lam for several days. I was surprised to learn, by reading Max's book, that it was he who rescued that cow, which he would eventually name Cindy Woo. “Somewhere I heard that a cow had escaped a slaughter house,” Max said. “It did not just fascinate me. I love cows, I love animals. And the first thing I thought was, she escaped from a slaughter house, I wonder what's happened to her? Where is she? “I found out that she jumped over a fence and ran for her life. I felt such sadness in my heart. There was this sweet little girl. She's not a human being, but a sweet little cow. Imagine if it were a little girl running for her life, a person. She was to be slaughtered.” The artist explained that he leapt into action immediately, making arrangements on the run to get to Ohio as quickly as possible. “Before I knew it I was at the farm where she got caught,” he said. “With a little bit of cash and some art, I made a deal with the farmer. He was very nice to me. He let me have the cow and I found a place called Farm Sanctuary in upstate New York. “I knew the guy from the sanctuary fairly well and he said, 'Sure bring the cow in, we'll take good care of her.' From that day on I've supported this sanctuary by giving them art so they can auction it off and I would send them checks once in a while to show my gratitude, not just for letting the cow stay, but all the animals. “I would go up every 10 days or so and meet the owners and they were always very friendly with me. I would stand outside the fence where she was in a grazing space and sometimes she would come up to where I was and I would pet her on her forehead. And she would look in my eyes and I would look in hers and I would always think, how can I tell her that I love her and love all her friends and that I'm so there for her and her species. It meant a lot to me to be involved in this little place in the world where I was able to save a cow. But it meant so much because loving animals and being into animal protection is one thing, but being able to be there, with your own mind and body and tell people what sweet little creatures they are. When I would leave I would have tears in my eyes.” Turn another page and find a plate image in the immediately recognizable “cosmic” style Max employed in the 1960s. A style so iconic, many people assume he was responsible for the Beatles' animated movie Yellow Submarine. 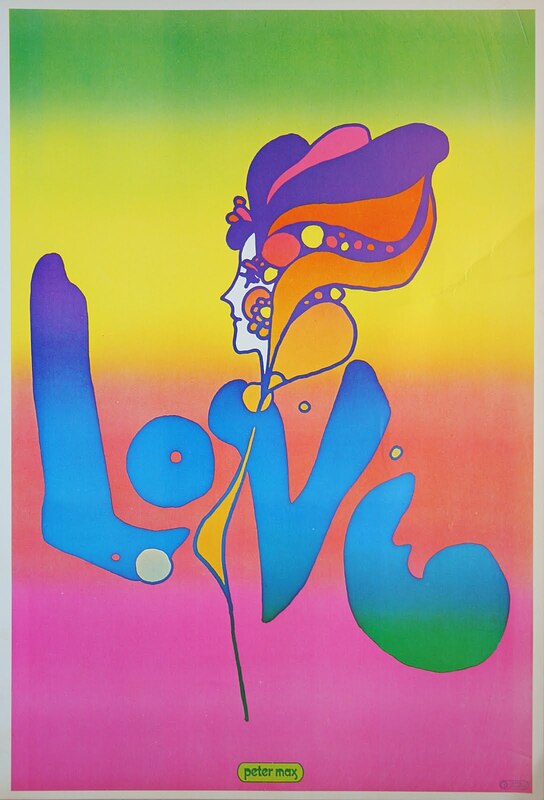 In fact the film's graphic design was the work of Heinz Edelmann, a German artist who was so influenced by Max, that his business card once read: Heinz Edelmann, the German Peter Max. Max says, at the time, he might have been a little perturbed, but his view has mellowed over the years. He holds no ill will. “Artists love other artists most of the time,” he said. “Sometimes, as in everything, there's a little bit of a competition. But I love the artists of America and from all over the world. If I can, I will support all the artists. I have a fund right now where we support other artists, I have another fund that helps animals and another that helps children in need. These are the things, probably that my mother and father would have done if they were around.” One guesses that Max might be most proud of his association with the Statue of Liberty, a tale so rife with coincidence and happen stance it is hard to believe. But it happened. It began with the Bicentennial year of 1976 when, for the first time, but certainly not the last, Max painted the Statue of Liberty. “The next year on July 4th, I said, hey, let's stretch two canvases and I'll paint two,” Max said. “The next year three and the next I did four. Then I did five and when it came to the next year, guess who came into the White House? My beloved old friend, who's not around any more, Ronnie Reagan. I met him many years ago on the steps of the Metropolitan Museum. He told me he was my biggest fan in the world. The day he met me he already had close to 42 pieces of mine. Believe me, I didn't know anyone who had 42 pieces of my work. And then I met him again and again and we started talking on the phone a lot. Then he told me he was going to run for governor, by then he had about 50 pieces. By that time we saw each other at least once a month if not sometimes three times a month. Then he was running for president and I said Ronnie you're going to win, absolutely. Of course he became president. “And I know that before his presidency was over he had 86 or 87 Peter Maxes. And I painted six Statue of Liberties on his Whitehouse lawn to commemorate my sixth year of doing the statue and also to pay compliments to Ronnie Reagan. He was a good buddy of mine.” But Max's association with our nation's most iconic statue did not end there. Following that Whitehouse studio session, Max met a man who showed him internal photographs of Lady Liberty. She was falling apart at the seams. Max's book tells how the planets aligned to accomplish the historic restoration of the Statue of Liberty (completed in 1986). Fate, so it seems, brought him together with Lee Iacocca (then president and CEO of Chrysler Corp.), who he met one morning in his studio apartment. “Usually people walk into my studio where I live and they go, 'Wow Peter, this is all your work,' because I've got a wall full of work, right?” said Max. “But ( Iacocca) walks in and the first thing he says is, 'Peter, where's your phone?' And he didn't comment about my art, so I felt a little funny for a second. “Then he cups the phone and says, 'I'm calling Coca Cola.' He says, 'Hey I'm here with Peter Max, we're going to get the Statue of Liberty renovated, can I hit you up for 15?' I say to myself, 15 what? And I couldn't imagine that it might be what I think it could be, I didn't even dare think it. Then he makes another call to Stroh's beer and says, 'Can I hit you guys up for 15?' Then he calls another person, I don't know who, and hits them up for ten. “So he tells me, 'I just raised $40 million.' It took him, literally, three or four minutes to raise $40 million, I couldn't believe it. So then he says to me, 'So Peter, this is all your work?' (Laughing) All afterward.” Eventually, Max says, Iacocca came up with more than $350 million for the restoration. Which led the artist to be on hand, along with Iacocca and Reagan, for the unveiling of the restored symbol of our nation. With his glowing praise of Reagan, one might assume his feelings stem from a particular political point of view. But no, Max just loves, well, pretty much everybody. “I'm very, very close to Bill Clinton,” he says. “He is a buddy of mine. When he got into office, to celebrate my good friend becoming president, I painted not one, not ten but 100 portraits of Bill Clinton. I was friends with Carter, all of them, I love them all. I adore them, I respect them because they are such an entity of this fantastic country. They're unbelievable.” And so is Peter Max. By the time I was wrapping up our interview, the artist was speaking to me as he would a friend, or a president. “All the best to you my buddy,” he said in parting. “I can't wait to meet you.” Sure, I understand he's promoting his book. But I couldn't help thinking his 60s thinking is really still with him. After all, he did profess love for a cow, Ronald Reagan and Bill Clinton in the same conversation.